So I LOVE music!!! All music, from Rock to Pop to Rap to R&B to Folk and Country to Classical to just about any other music genre you can think off. Just as a basis, you should know that my very favorite musical artist are The Beatles, Michael Jackson, OutKast, Kate Bush, Justin Timberlake/*NSYNC, Matchbox Twenty, Billy Joel etc. From that wide range of artists I just mentioned you can get a little feel for my wide range of musical tastes, but that is just the tip of the iceberg of how expansive my tastes are and how deep my love of music goes. I’ve always had this love for music and have had many different influences in my life that have shaped my eclectic tastes. I grew up listening to music around my Mother mostly and she had me listening to a lot of Pop, R&B & Disco. My father was more into Classical Rock. Being that I was raised by my Mother, I wasn’t exposed to as much Classical Rock in my early years as I would have been, had my Dad been around me more playing that short of stuff. So in my early years I was very much into the type of stuff my Mother listened to and my earliest favorite artist I can remember was Michael Jackson and as I’ve just stated he’s still up on top for me. My older Brother listened to a lot of 90’s Dance music and Rap while I was growing up which later changed to Metal and Hard Rock. So with the combination of my Mother’s influence and my Brother’s influence, by the time I was about 13 to 15, I started to discover my own music taste. Some of the first artists I remember finding and liking all on my own were *NSYNC, Matchbox Twenty, OutKast, Eminem and The Beatles. Between about 2000 to 2010, throughout high school, college and post college, I dabbled here and there with all sorts of music. Learning about new stuff from friends, media and my own quest for great music. In 2003, OutKast released the incredible “Speakerboxxx/The Love Below”, which is my very favorite album and had a huge impact on me. The reason I love it so much is because it, like me and my musical journey, experimented with all different genres, styles and sounds. It is still the only pure Hip-Hop album to ever win Grammy for Album of the Year. This album opened me up more than ever to new sounds and adventurous music. I started listening to other experimental artists and groups like Pink Floyd, The Grateful Dead, Kanye West, Gnarls Barkley and more. I always said the only genres I didn’t really care for were Country and Metal/Hard Rock, but in recent years that wall has started to crumble. When it comes to Country, I actually had a phase when I was around 10 and Achy Breaky Heart by Billy Ray Cyrus came out that I listened to a lot of country, but that phase passed pretty quickly. Now a days I enjoy listening to some of the more poppy stuff like Taylor Swift, Lady Antebellum and Dierks Bentley, but also some more gritty Country Rock, like Lynyrd Skynyrd and The Allman Brothers. When it comes to Metal/Hard Rock my likes don’t stretch to far because I’m a sucker for Harmony and Melody and I personally find it difficult to hear those elements in Metal and Hard Rock, but I do throughly enjoy System of a Down, early Linkin Park, AC/DC and some others. I’ve always had a VERY strong desire to create music, but never had the opportunity or resources to learn to play an instrument, so I joined chorus in school and acted and sang in school musicals to exercise that desire as much as possible. In high school and early college I actually started rapping over instrumentals with friends, which was a great way to make music without having to know how to play an instrument. It was a great creative outlet for me, but after a certain point, just rapping wasn’t enough for me and I felt boxed in and unable to really express my musical ideas anymore, because I didn’t have the theoretical knowledge or the knowhow with an instrument to be able to further my creative growth in music. I stopped making music in about 2006 and since than I haven’t thought to much about creating, but in the last few years and especially the last year as I’ve been trying to step a little more out of mainstream music and into more unexpected artist as well as classic/legendary artists, I’ve realized my desire to no longer be solely an observer (listener) of music, but also a participant (creator) or music. So I have made it my new goal to get a guitar and to start practicing and taking lessons. This leads me to the reason I wanted to start this blog in the first place, which was to have an outlet to share my pretty vast knowledge of music and learn more about music from all of your vast knowledge of music. I also want to document and share my musical journey as I discover more music and learn to play music myself on the guitar and hopefully one day on the piano. I hope that Volume 11 can become a community of passionate music listeners, players and creators. A place where we can share and enjoy all that the music world has to offer. So let’s turn up the music to Volume 11 and jam out!!! 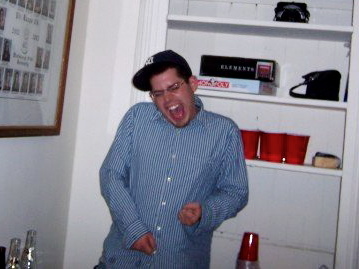 Me, about 4 years ago cranking the music up to Volume 11 and rocking out with my air guitar. I really need to learn to play a real guitar; air guitar isn’t cutting it anymore. This entry was posted in Me, Music and tagged *NSYNC, AC/DC, Billy Ray Cyrus, Classic Rock, Classical, Country, Country Rock, Disco, Eminem, Folk, Gnarls Barkley, Hard Rock, Hip-Hop, Justin Timberlake, Kanye West, Kate Bush, Linkin Park, Lynyrd Skynyrd, Matchbox Twenty, Metal, Michael Jackson, Music, OutKast, Pink Floyd, Pop, R&B, Rap, Rock, Speakerboxxx/The Love Below, System of a Down, The Allman Brothers, The Beatles, The Grateful Dead. Bookmark the permalink.